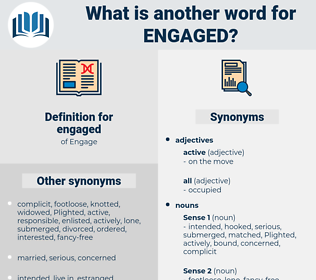 What is another word for engaged? having enough on ones plate. servants, Hires, workers, committed, Incurred. Managed, arranged, collaborated, Indulged, Entered, initiated, Waged, interacted, Garnered, Challenged, practitioners, alleged, staged, Enjoyed, endeavoured, actively, interactive, Enabled, Generated, pledged, concentrated, open, opened, joined, partners, learned, Inaugurated, Incriminated, mainstreamed, Began, address, addressed, Gained, abandoned, earned, partnered, Commencing, endorsed, invited, perpetrate, Adhered, sustained, Ensued, assembled, charged, invested, Activities, granted, Urged, restrained, weakened, spoke, Existed, represented, Caught, utilize, utilized, Manifested, commit, Appeared, conduct, conducted, contact, contacted, practice, practiced, practices, Deployed, accessed, accepted, Enshrined, co-operated, Argued, Examined, activated, surrendered, experienced, acquired, understood, sent, Seconded, pursued, registered, retained, spent, Convened, behaviour, discharge, inspired, led, observed, handled, assumed, advised, Launched, Contended, reactivated, use, announced, Pleaded, Underwent, asserted, consumed, associated, initialized, triggered, Dampened, Introduced, adopted, Suffered, Proceeded, spearheaded, Brought, collected, sat, prepared, common, broke, Remained, Was, Were, Followed, achieve, Achieved, appropriated, shared, hired, provoked, Arose, Competed, Invaded, Inserted, Performed, selected, recruit, Recruited, Appealed, recorded, Influenced, Helped, continued, Detained, Obtained, Volunteered, contested, responsible, Tackled, Relied, recommended, classified, Issued, Steered, related, Discussed, ensured, ensuring, celebrated, Attracted, area, wield, commissioned, Carried, noted, considered, included, Chose, Conflicted, rejected, undermined, Arrived, directed, Captured, bind, applied, determined, intended, Fought, Benefited, signed, set, reported, concerned, developed, approved, absorbed, sponsored, opted, interested, laid, raised, Came, mobilised, Demanded, recourse, Promoted, Took, seized, exposed, moved, Filed, Wondered, Meant, mandated, received, elicited, contained, Questioned, chartered, withheld, placed, Displayed, Pioneered, Approached, Instituted, Institutes, Purchased, Summoned, added, Stayed, turned, Consisted, Resulted, Gave, allocated, expressed, realized, linked, opposed, allotted, Resorted, Occurred, Stood, deducted, Became, Reached, started, Served, confirmed, paved, lay, ruled, Dealt, inhibited, felt, PARTE, Stepped, headed, Floated, Pushed, shot, drew, Persisted, processed, pointed, held, Upheld, featured, found, tied, Told, completed, cast, covered, Occasioned, Had, events, Asked, resolved, welcomed, Offered, won, preserved, Plying, decided, Provided, Caused, hosted, Attacked, caring, HIT, contracted, implied, paid, plugged, produced, hijacked, forced, Accounted, drove, functioned, functions, Wished, mounted, Went, Than, struck, Stowed, Picked, released, gripped, required, effected, act, Acted, wanted, Ran, lf, promised, loaded, Shipped, focused, focussed, Tasked, tasks, Prompted, Awarded, ordered, listed, Vowed, formed, unfold, unfolded, Got, rolled, docked, crossed, Lasted, dried, requested, requests, Passed, Met, Supplied, kept, founded, stated, Claimed, pulled, tried, party, Looked, remembered, officers, figured, based, cut, Did, made, committed, involved, enlisted. Managed, arranged, acknowledged, collaborate, collaborated, exchanged, leveraged, Entered, endangered, initiated, integrated, Waged, interacted, cooperation, Challenged, Intervened, alleged, co-operation, endeavour, guaranteed, implemented, Enjoyed, endeavoured, Enabled, Investigated, implementation, gathered, organised, energised, preferred, Generated, Communicated, pledged, relationship, Enacted, damaged, Encountered, forged, consultation, concentrated, Begun, opened, relations, Learnt, joined, presented, learned, Inaugurated, Efforts, mainstreamed, Penetrated, disconnected, Administered, addressed, geared, engulfed, Entailed, compensated, Gained, abandoned, interference, partnered, endorsed, motivated, obliged, invited, contaminated, adherence, specialized, threatened, invest, Responded, sustained, intervention, assembled, charged, encumbered, invested, spoken, Activities, granted, Explored, Urged, restrained, Plunged, weakened, enveloped, applicable, specialised, represented, Caught, utilized, Perpetrated, Attributed, substantiated, dominated, subscribed, left, Appeared, stimulated, conducted, practised, contact, contacted, practiced, Deployed, Consulted, accessed, combined, accepted, Enshrined, co-operated, commited, accompanied, Argued, Examined, Lodged, activated, surrendered, experienced, appointed, connected, acquired, Targeted, advanced, conceived, Confronted, sent, Seconded, designated, Ourselves, Embraced, discharged, Immersed, Happened, suggested, pursued, altered, registered, retained, apportioned, spent, Convened, Prosecuted, inspired, led, Rendered, handled, action, expanded, assumed, accomplished, advised, finalized, heartened, Undergone, Launched, employment, manufactured, condemned, Transferred, attained, Contended, Channelled, announced, admitted, asserted, consumed, Harvested, identified, associated, initialized, triggered, frustrated, Persuaded, authorized, Introduced, distributed, maintained, adopted, landed, disqualified, diminished, spearheaded, Brought, animated, Borne, outsourced, collected, tappedthe, ground, faced, sat, prepared, treated, Remained, Followed, Achieved, appropriated, shared, hired, provoked, inhabited, help, married, inscribed, Injected, Inserted, continuing, Performed, expended, selected, safeguarded, Recruited, utilised, dented, Appealed, recorded, populated, Influenced, afflicted, Helped, Excluded, Invoked, complicit, continued, co-sponsored, Detained, established, Obtained, Grabbed, Jeopardized, wedded, Mentioned, correlated, destined, contested, responsible, Tackled, Advocated, implicated, Relied, aroused, located, classified, Delegated, Strived, Striven, emphasized, Exerted, Issued, Inflicted, Steered, related, converted, informed, Wielded, Discussed, convinced, Grounded, concluded, ensured, Submitted, actuated, Attracted, Incited, published, Screened, preoccupied, Transported, Resisted, commissioned, measured, Delivered, Carried, noted, affiliated, fostered, bound, considered, chosen, included, Referred, declared, rejected, realised, Hampered, attempted, undermined, Arrived, directed, Hindered, embedded, Succeeded, Created, Captured, interviewed, accused, calculated, applied, Been, Combated, determined, restricted, Constructed, proposed, composed, intended, Fought, stopped, sworn, Benefited, guided, signed, set, taken, supported, concerned, jeopardised, developed, defeated, Bombarded, approved, absorbed, opted, extended, Avoided, leased, interested, tapped, Duplicated, impaired, laid, come, raised, unleashed, collapsed, Pegged, mobilised, Demanded, recourse, Promoted, induced, disposed, seized, exposed, moved, defined, Filed, Meant, mandated, sir, conscripted, received, elicited, imposed, wasted, uploaded, contained, grasped, Questioned, chartered, touched, posed, reasoned, designed, traded, withheld, placed, Displayed, assaulted, given, executed, Cited, travelled, reflected, trained, split, activity, dismissed, links, Procured, Approached, Instituted, sparked, Purchased, formulated, resort, shelled, overcome, added, Stayed, vested, Compiled, turned, become, Aimed, Consisted, Resulted, allocated, expressed, Notified, realized, Disbursed, Spared, highlighted, linked, opposed, Debated, betrothed, allotted, settled, Resorted, Occurred, solved, Seemed, Stood, have, Has, deducted, Reached, handed, embodied, Complied, started, specified, Flown, Served, Subjected, process, diverted, shaken, paved, Clashed, checked, outlined, fired, Talked, Viewed, surrounded, Dealt, Installed, Yielded, drawn, delayed, mated, dispatched, felt, Meted, paired, course, Stepped, headed, Pushed, Devised, shot, work, Worked, processed, pointed, held, Upheld, featured, found, grown, risen, thwarted, tied, permitted, Canvassed, completed, speech, Domiciled, Drafted, spread, reviewed, cast, Stationed, Shown, Compromised, divided, covered, stuck, Had, centred, strained, broached, planned, sampled, Asked, resolved, welcomed, latched, reserved, artwork, role, Offered, Availed, won, fulfilled, fallen, remunerated, preserved, decided, Provided, rehired, seat, seated, Marshalled, Boarded, Caused, Switched, Logged, suspected, trapped, Attacked, filled, washed, HIT, contracted, implied, sold, eroded, paid, Spurred, justified, prescribed, driven, produced, gone, resolute, wrapped, Lived, full, forced, dropped, bombed, thrown, credited, acting, called, manned, scheduled, mounted, shut, convicted, locked, Cared, elaborated, knotted, struck, Picked, run, released, lifted, poised, mixed, required, effected, Accorded, act, Acted, matched, built, expected, Surveyed, centered, Believed, task, bolted, promised, loaded, rooted, fixed, staffed, Fitted, Shipped, focused, focussed, Tasked, Prompted, Awarded, Steeped, obligated, Gotten, funded, ordered, listed, solicited, formed, unfolded, Bought, Got, rolled, doomed, Strapped, coupled, docked, secured, closed, Piloted, serviced, crossed, clocked, box, booted, mired, Lasted, dried, projected, requested, Passed, Met, booked, Supplied, kept, founded, stated, studied, Claimed, pulled, tried, Parties, party, Looked, Tripped, remembered, controlled, figured, based, named, made, done, committed, involved, Incurred, enlisted. encouraged, Cooperated, Intervened, intermingled, implemented, Instigated, undertake, Undertook, gathered, organised, organized, Galvanized, entrusted, agreed, Responded, Embarked, practised, appointed, identified, assisted, maintained, exercising, Exercised, sought, Operated, established, concluded, empowered, devoted, Incited, part, battle, Battled, Delivered, exert, instructed, supported, occupy, Occupying, played, executed, activity, betrothed, clash, Clashed, fired, With, attached, work, working, Worked, sector, called, Threw, built, Securing, secured, active, Incurred. encouraged, Cooperated, Undertaken, incorporated, organized, entrusted, harnessed, enforced, agreed, mobilization, nominated, Embarked, discussion, liaised, assisted, pressed, exercise, Exercised, sought, Operated, empowered, devoted, embroiled, instructed, occupy, Occupying, played, attached, Visited. bored, uninterested, unoccupied, inactive, idle, disinterested. uninvolved, Disengaged, not working, available, inoperable. latent, unreserved, free, passive, inoperative, ungeared, nonoperating, quiescent, slow, asleep, dead, dormant, lifeless, unconnected. He was engaged in taking something out of the boat. encode, enunciate, enact, enhanced, encased, ensete, eumycota, enkaid, enkidu, emaciate, emaciated, emeside, encysted, enmeshed.